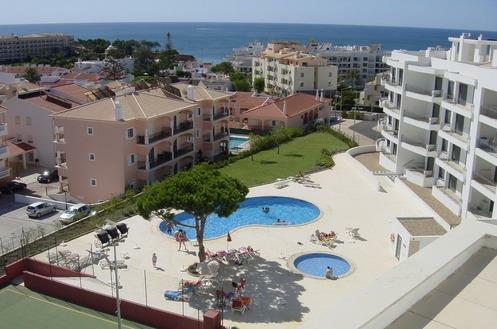 2 bed apartment, Olhos D'Agua - Property for sale. Full Description: In an excellent location for holidays or permanent residence is this 2 bedroom fully furnished and equipped apartment right in the centre of the popular resort of Olhos D'Agua. Within very easy walking distance of all amenities including the beach, shops, bars & restaurants, taxi, bus, banks, supermarkets, pharmacy...in fact everything you could possibly need for a perfect break! The apartments in this condominium have been built to a very high standard with quality fixtures and fittings. This apartment is located on the ground floor with views of the complex, gardens, tennis court, swimming pool and the sea beyond. Accommodation comprises an entrance hallway, shower room, en-suite bedroom with full bathroom and fitted wardrobes, 2nd bedroom and a lounge with American style open plan kitchen with full range of appliances. The apartment has a private balcony plus extras including air conditioning, wifi internet, English TV, double glazing, security entry system and shutters/fly screens on all doors and windows. It has been furnished and equipped with luxury in mind and everything is included in the asking price presenting a complete turn-key option. In addition the apartment benefits from an allocated underground remote entry parking space and there is also private outside parking. The communal areas are spacious and include a swimming pool and separate childrens' pool, landscaped gardens with CCTV, flood-lit tennis court and a roof terrace with stunning 360 degree views of the sea and the countryside. Considering the location, excellent living areas and the exceptional build quality viewing is highly recommended.